Saint Tirumangai Azhwar had sung the glory of Lord Perumal of the temple in his Mangalasasanam hymns. 10 day Vaikasi Poornima car festival in May-June; 10 day Aadi Pooram festival in July-August; Aavani Krishna Jayanthi in August-September; Tamil and English New year days, Deepavali, Pongal are the festivals celebrated in the temple drawing huge crowds. 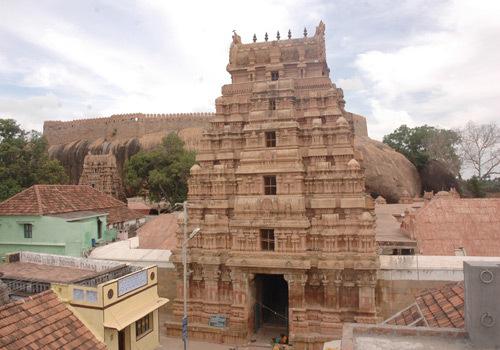 This is one of the 108 Divyadesa temples of Lord Perumal. 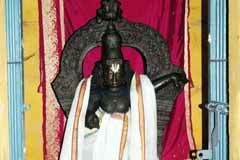 There are two presiding deities in the temple Lord Sathyamurthy and Lord Tirumeyyar. Thailakappu is performed on the presiding deity once in 12 years. Sri Sri Sathyamurthy Perumal Temple, Tirumayam-622 507, Pudukkottai district. To promote harmony among the Saivites and the Vaishnavites, two temples including this one, were constructed having a common compound wall. The temples are on the slopes Tirumayam hill from a single rock. One cannot circumambulate a single temple but only jointly. Devotees pray for wedding, child boon. For child boon, people pray to Ujjeevana Thayar and for all prosperity. 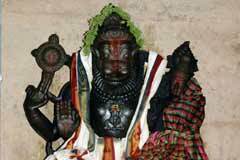 Also those suffering from spells and witchcrafts, nervous debility and mentally affected pray to Thayar. Devotees strongly believe that Thayar will certainly come to their rescue when in troubles. Devotees perform Tirumanjanam to Thayar, offer vastras, bangles and dolls. To Perumal they offer butter and vastras, tulsi garlands and light lamps. The nivedhana offered to Perumal is distributed to the devotees coming to the temple. Some arrange feeding – Annadhana. Lord Perumal praised as Sathyamurthy Perumal graces the devotees from the sanctum sanctorum under the Somachandra Vimana, holding His discus and conch in standing posture. 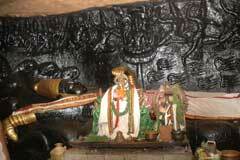 The place is praised as Sathya Kshtram after the name of Lord Perumal. Lord Tiru Meyyar after whose name the place is named as Tirumayam is in His reclining posture on the Adisesha serpent bed graces from another shrine. 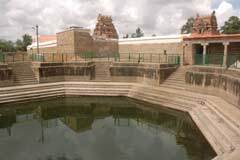 It is said that this reclining Perumal is the biggest in <?xml:namespace prefix = st1 ns = "urn:schemas-microsoft-com:office:smarttags" />India. His eyes are half closed. Perumal is surrounded by Sages and Devas. Lord Brahmma appears from His naval chord. Mother Mahalakshmi graces devotees from Lord’s chest. Every sculpture is as beautiful as in Mamallapuram infusing Bhakti and love of art. 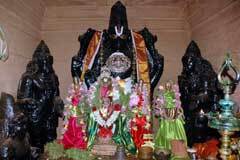 Lord granted darshan to Sage Sathya Maharshi in this temple. This is a seventh century temple. While Lord was in His Yoga Nidhra on Adishesha – pretending to be asleep - two demons Madhu and Kaidaba came there to abduct Mother Mahalakshmi and Mother Bhoodevi. 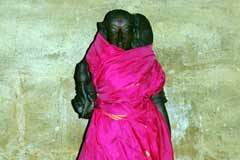 Afraid of them Mahalakshmi hid in Lord’s chest and Bhoodevi at His feet. 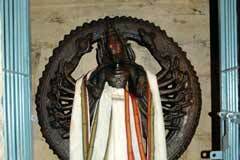 Unwilling to disturb the sleep of Perumal, Adisesha spit his venom from his tongues and drove away the demons. Adishesha was afraid that he acted without the permission of Lord. Lord said that he did only good and appreciated his action. To prove this event, Adisesha appears in a shrinking posture, says the Sthala Purana – local history. 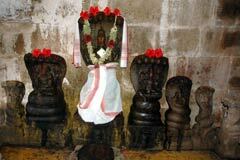 Miracle Based: The Kudavarai temple is one among the Divyadesas of Lord Vishnu. There are two presiding deities, Lord Sathyamurthy and Lord Tiru Meyyar. 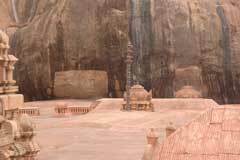 Tirumayam is 84 km from Madurai on the Pudukkottai road. Bus facilities are conveniently available to reach the place.